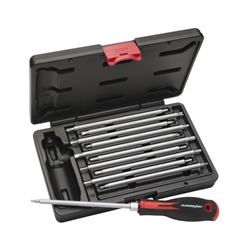 Unlike most multi bit sets, this security screwdriver set uses long shafts to get at recessed screws up to 5 inches deep. The handle features a non slip comfort grip. The kit includes 11 long shafted security bits for 22 different styles.